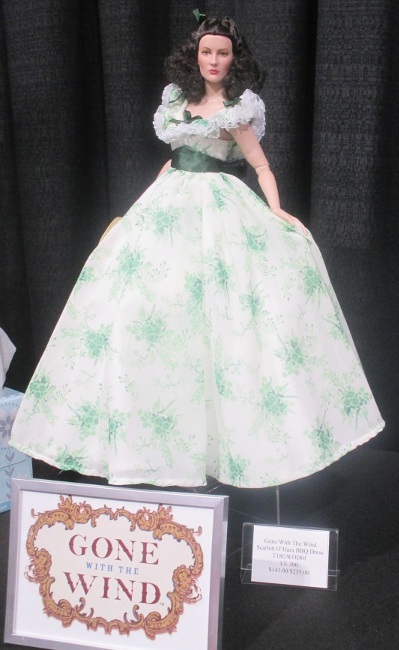 The ladies (and one laddie) that decorated Tonner’s booth were a good-looking assortment of comic-book heroines, Hollywood heiresses, and contemporary fashionistas. As always, the faces were swoon-worthy and the costuming was exquisite. Resulting from a science mishap, DollFace is a living BJD witch-hunter who prowls Boston! 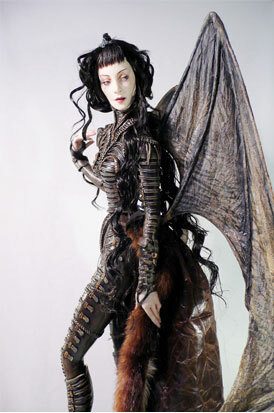 On the surprising side, Tonner had a fabulous version of DollFace, the quirky lead character in a sci-fi/supernatural graphic novel. Created by authors and illustrators Dan Mendoza and Bryan Seaton, DollFace is an agent of havoc that collectors can get behind. 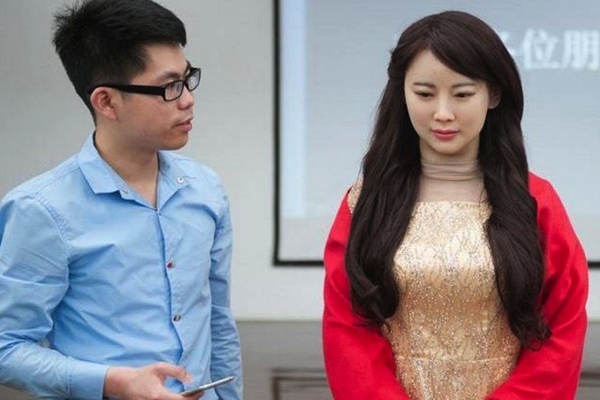 According to her origin story, a pair of MIT students is monkeying around with a 3D printer to create the perfect woman. Despite their best intentions, and because technology can’t always be tamed, the students end up transporting the soul of a 17th-century woman into the life-size body of BJD doll! (I hate when that happens.) Yes, Lila becomes a witch-hunter trapped in the body of a 3D-generated doll. Now, that’s a guilty pleasure if ever I encountered one! It takes “Mannequin” to a whole new ethereal and evil pinnacle! Kadira blank dolls in light and tan skin tones. It makes sense that Tonner gravitated to this breakout comic star. Under the banner of his Phyn & Aero line of dolls, which are resin ball-jointed creations made via 3D technology, Tonner and his collaborator, Andrew Yang, are combining futuristic manufacturing with perennial glamour. 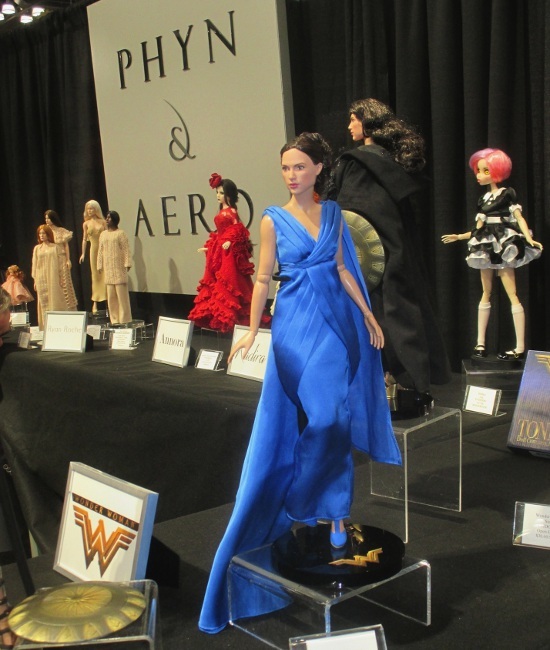 Yang, the great-grandson of Mary Astor, was at the Tonner booth to talk about the portrait doll that was made of his famous celebrity ancestor, and also to chat about the Kadira doll that was birthed through the Phyn & Aero process. Kadira in her Ophelia ensemble. 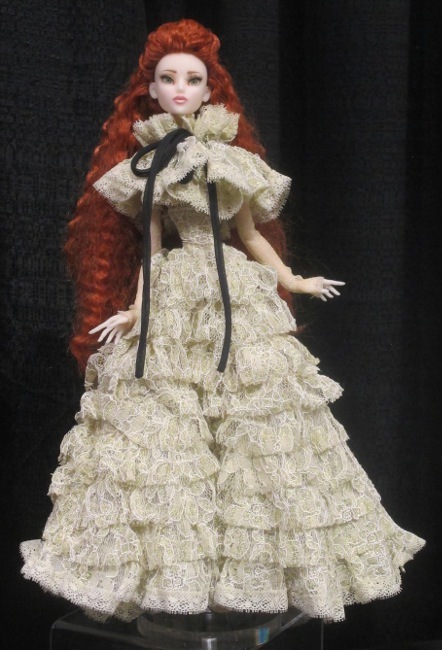 The Kadira doll is deemed a woman of mystery. Her backstory is worthy of a 1940s Mary Astor or Bette Davis screenplay. With a name that derives from the Arabic word for “powerful woman,” Kadira was at the booth garbed in her Ophelia costume. A nod to the troubled and love-struck Shakespearean heroine, Kadira wears this metallic lace dress to the glittering London Renaissance Ball. Kadira’s identity is not known by the other wealthy attendees, but her presence is felt by every eligible man who walks the red carpet beside her. An enigma, a puzzle, and a sphinx, Kadira is a woman who has gossips speculating and financiers frazzled. What a plot! What an origin story! Annora Monet is the Lady in Red. Equally arresting is the other Phyn & Aero creation, Annora Monet. Clad in an eye-popping ruby-red number, Annora Monet is rumored to be descended from a long line of artists. (Great-great-great-grandfather Claude, perhaps?) She views her face as a potential canvas, a blank slate that allows her to express her deepest emotions and to cause potential suitors to do a double take. The exotic and alluring doll was designed by Tonner and has the posture and dimensions of one of his sleek American Model dolls. 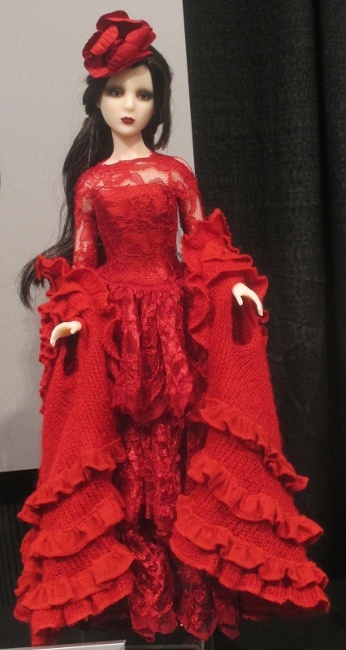 This BJD version wears a costume that is opulent and glamorous. 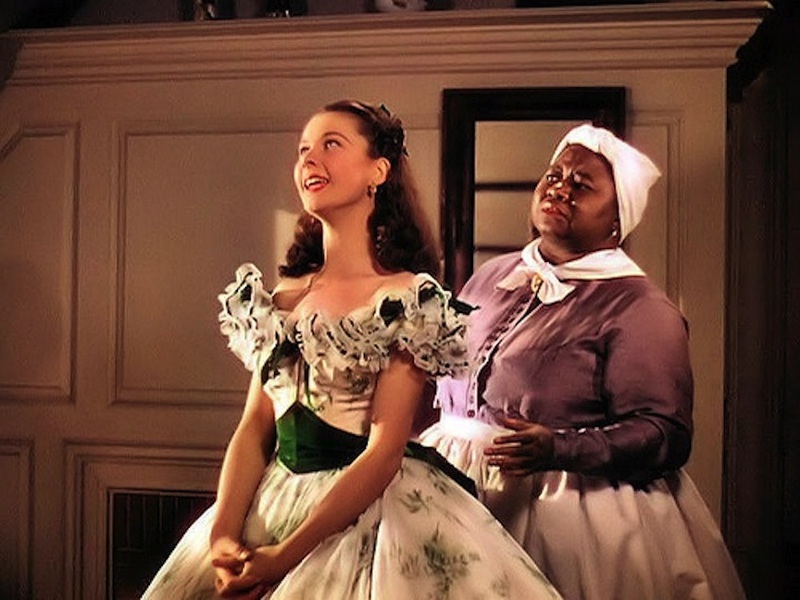 Scarlett O’Hara in the legendary barbecue costume. Beyond the velvet-gloved machinations of a calculating Civil War belle, Tonner also unveiled a trio of his Wonder Woman designs. The doll looks exactly like Israeli model/actress Gal Gadot. The facial sculpting is astounding. Her costuming runs the gamut from her recognizable red-gold-and-blue formfitting tunic to her Amazonian military training costume to a knock-out dazzling blue evening gown. 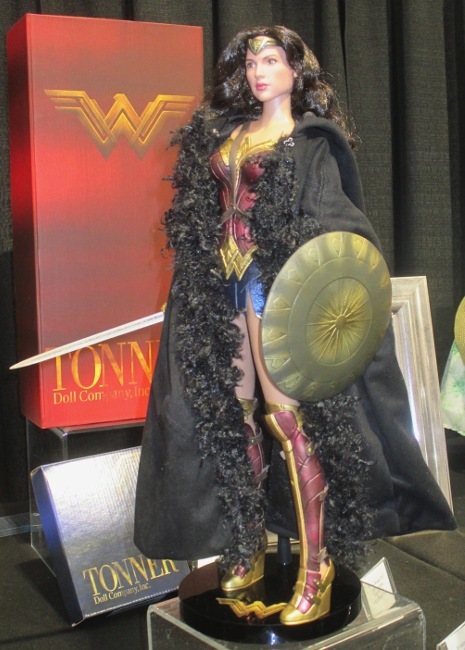 Wonder Woman in her recognizable costume. 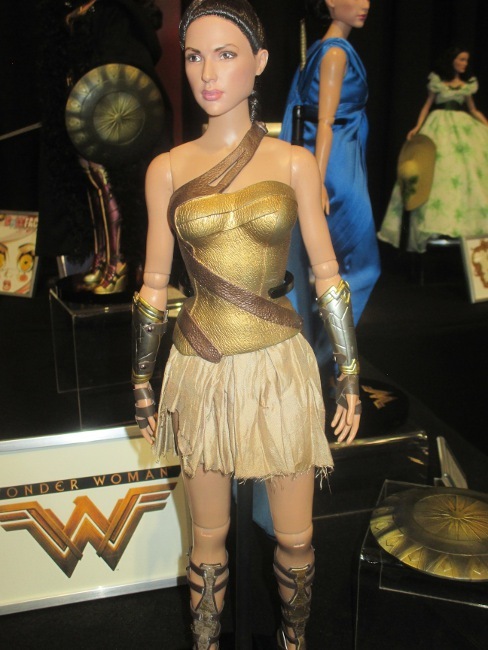 The Wonder Woman dolls pay homage to the best aspects of femininity: strength, courage, beauty, poise, loyalty, and selflessness. That’s a lot to put forward in a doll, and Tonner accomplishes it. Portrait of Gal Gadot in Amazonian military academy gear. Joining the Wonder Woman array of garments are the new line of Ryan Roche knitwear, as well as tribute portrait dolls of Outlander characters. The stunning red gown, which I blogged about previously, lives up to the hype. Seeing it in person does not disappoint! Ryan Roche line of knitwear for dolls. There was also the official portrait doll of Jamie Fraser, the hunk who sends modern-day women’s hearts racing. Unfortunately, I was not allowed to photograph the Jamie doll, but it is a remarkable likeness. It will be available for sharing when the series producers give it the green light. 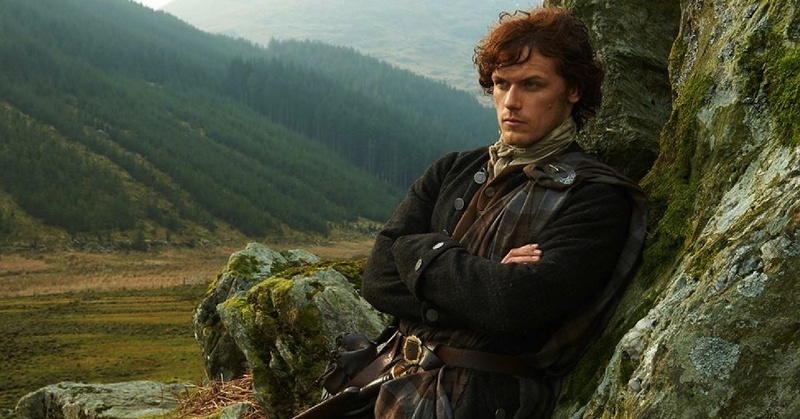 In the meantime, feast your eyes on the actor, Sam Heughan, who embodies him. There’s always so much at Tonner’s booth at Toy Fair, and 2018’s gathering did not let me down. NextToy Fair 2018: Are You Ready to Join the Doll Fight Club? 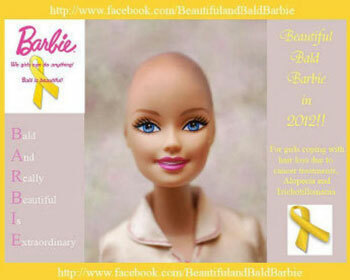 Barbie Beating Cancer: Is Mattel bound to make a connection?